An amazing cast with gorgeous voices is unfortunately let down by questionable writing and overall content. 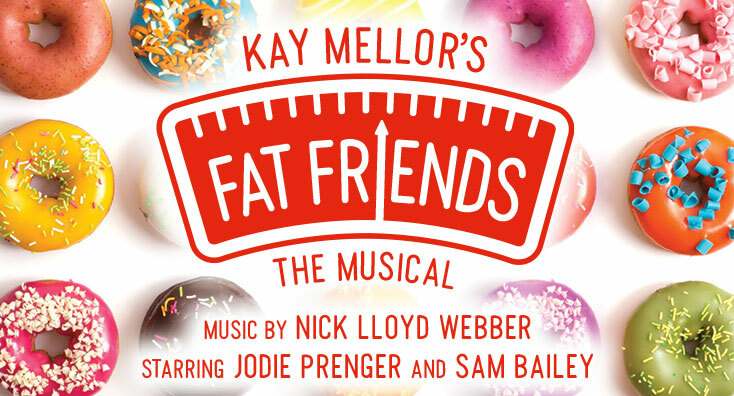 The musical adaptation of Fat Friends is currently on at Mayflower Theatre in Southampton. It is based on the 2000 to 2005 television series of the same name and was penned by the show’s original writer Kay Mellor. When reading through the programme, I came across a piece written by Mellor describing the trap of the diet industry in the 21st century and the serious issue that body image represents. Unfortunately, Fat Friends: The Musical does not represent this at all. The show follows Kelly Stevenson, her fiancé Kevin and her chip shop owning parents Betty and Fergus. Kelly tries on her dream wedding dress, but gets disheartened when she can’t fit into the largest size. Betty then suggests she join her church slimming group, led by Lauren, to lose the weight to fit in the dress. She is then challenged by the owner of the slimming group franchise, Julia Fleshman, that if she lost enough weight to fit in the dress, the franchise would pay for Kelly’s wedding and dress. To make sure Kelly loses enough weight quickly, Julia gives her dangerous slimming pills that have a serious effect on her health. At the end of the show, Kelly supposedly realises that she doesn’t need to lose weight to be happy. Alas, this did not come through at all. In fact, almost the opposite effect was felt. There was a continual reference to someone’s worth relating to their weight and how that defines them as a person. One example is when town sweetheart Alan confesses about his wife leaving him for another man and Lauren quips “maybe if you lost a bit of weight, your wife would come back to you”, as if his being overweight was her reason for divorcing him. Kelly throughout the first act always states that she’s happy being bigger than average and that she doesn’t need to lose weight to be comfortable in her own skin, and yet she somehow ends up with a ballad about how she wishes she could be thin to look beautiful at her wedding as the closing song of act one. There seems to be vast contradictions in her character’s view of herself and her self-worth. Frankly, there seemed to be a running theme correlating being thin with being happy. The theme of body positivity was given a huge chance at the end of the musical with the reprise of ‘Beautiful’, where Kelly states that Kevin makes her feel beautiful by loving her. This part particularly angered me due to her self-confidence stemming from a relationship with a man rather than self-love, which this show was ideally trying to promote. This really transmits a horrible message to the audience (in particular younger viewers): you can only be beautiful if a man tells you so. Understandably, Mellor did try to create a “thin” character (Lauren) to try and show how being thin doesn’t necessarily correlate with happiness. This character, however, seemed to have an obsession with “losing those last few pounds”, to the point of bordering with an obvious eating disorder which was never once addressed by the show and only passed as normal. The show should have promoted healthy body images but seemed to present an eating disorder as perfectly acceptable and overeating as stemming from a place of misery. Another series issue with the show is the bizarre unpolitical correctness used throughout and how the comments were passed off as humour. A line that particularly hit me was when Julia’s assistant Pippa admits to parking in a disabled space to which her boss then answers “You better limp on the way back to the car then”. Not only was this comment insensitive to a myriad of people with genuine disabilities but also seemed incredibly misplaced and without context, seemingly only used to emphasise Julia’s nasty personality. Although admittedly the show was set in Yorkshire, the amount of unnecessary Yorkshire references was bordering on stereotype overload that definitely cheapened the overall effect of the show and its authenticity. The show had serious issues with plot and book but there were several positive notes. The quality of the singing was phenomenal, with Jodie Prenger playing Kelly wowing with her range and vocal ability as well as Sam Bailey playing Betty giving me goose bumps with her impressive riffs. Even famed cricketer Freddie Flintoff gave a great performance for someone not professionally trained. Some songs in the soundtrack stood out to the audience as particularly humorous such as ‘Chocolate’, where three of the ladies in the slimming group daydreaming about large chocolate bars. Another standout song was ‘Corset Song’, where Kelly reminisces about her fiancée enjoying sexual enterprises with her in a corset. The rest of the soundtrack, sadly, was disappointing with most songs merging into the next. The lyrics were also disappointing and seemed almost childish. An example is during Flintoff’s solo ‘The Only Fool Is Me’ where he is heard to say “I am a loser, how could you want to marry me”. So much more could have been done with the score composed by Nick Lloyd Weber. The staging really impressed. There was an amazing use of space and lighting that really captivated the audience into the town and its inhabitants. The wedding dress store opened up to reveal what was inside, which showed a beautiful use of set to give more dimension and realism to the piece. The costumes were similarly great: they emphasised the modern setting of the show as well as often bringing colour and vivacity to the otherwise drab town. Overall, the show was a series of disastrous jokes with cheap jabs at disabilities, body image and labelling. The music was sang wonderfully by the whole cast with harmonies that made me smile, the choreography was simple yet effective and so were the costumes, and yet these positive qualities still did not detract from the questionable writing and lack of sensitivity towards those who genuinely suffer with their weight. Fat Friends: The Musical is on at Mayflower Theatre from the 5th to the 10th of February.